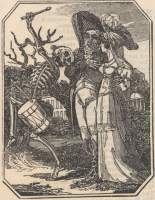 1824: Portfolio introduces a series of cuts by "Mr. Bewick". 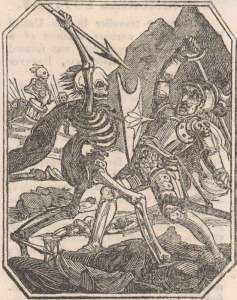 Death attacks the soldier with a large arrow instead of a bone. The genuine John Bewick's woodcuts were destroyed by fire in 1803. 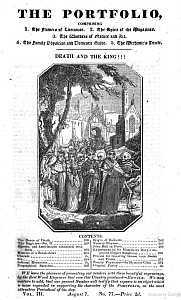 Nevertheless, 7th August 1824 the magazine "The Portfolio" featured an octagonal woodcut, which was a copy of the frontispiece created by John Bewick: Death leading all citizens out of town to the open grave (picture to the left). The woodcut was followed by this blurp: »WE have the pleasure of presenting our readers with three beautiful engravings by the first Wood Engraver that ever this Country produced — Bewick. We may venture to add, that our present Number will testify that expence is an object which is never regarded in supporting the character of the Portfolio, as the most attractive Periodical of the day«. 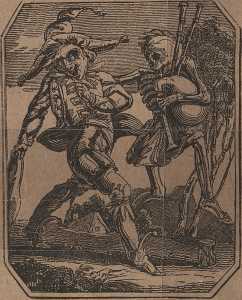 In the following issues, several of these octagonal woodcuts were featured, two and two. 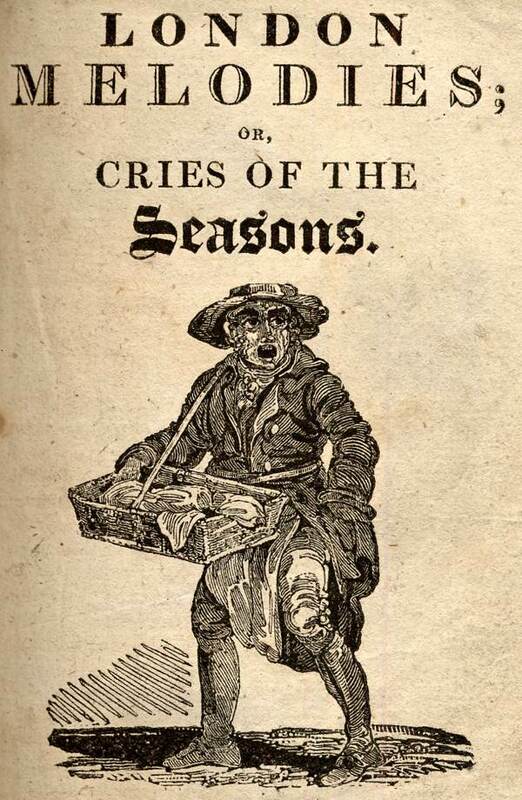 Above each pair of woodcuts was the title »The cuts by the celebrated Bewick«. At a first glance these woodcuts are so special that it's hard to tell whom they are supposed to copy, but when Death attacks the soldier with an arrow instead of a bone (picture to the right), we know it isn't a copy of Bewick, but rather of Birckmann, Hollar or Deuchar. 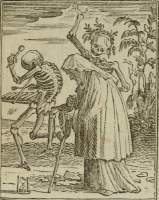 And verily: All the woodcuts that were brought were among those 30 dancers that Hollar had engraved. And under each picture was the same letter-press that had been used in the 1816-edition of Hollar. After having produced copies of 28 of Hollar's 30 etchings (Death's Escutcheon and the soldier was still missing), the editor needed letter-press for the rest of the dance (i.e. 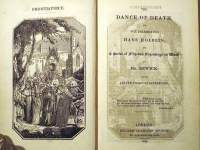 those dancers not in the 1816-edition of Hollar). Since the letter-press for the 1816-edition of Hollar was taken from earlier editions of Deuchar (who in turn took them from Mechel), the logical step would have been to get hold of an edition of Deuchar to get the rest of the letter-press. 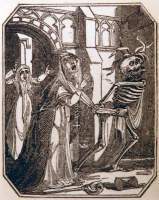 But instead the editor chose to accompany all the following woodcuts with the stilted verses from the genuine Bewick's book. When you don't bother to read the text you're stealing, the result can become rather bizarre. 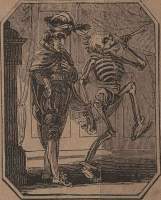 According to the caption for this picture of two skeletons, "the two figures […] represent the dress of the Swiss Nobility of the sixteenth century." 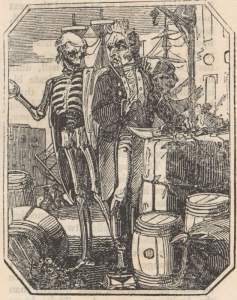 When then 50th woodcut was published 23rd October 1824, the magazine ended with an announcement: »Announcements. 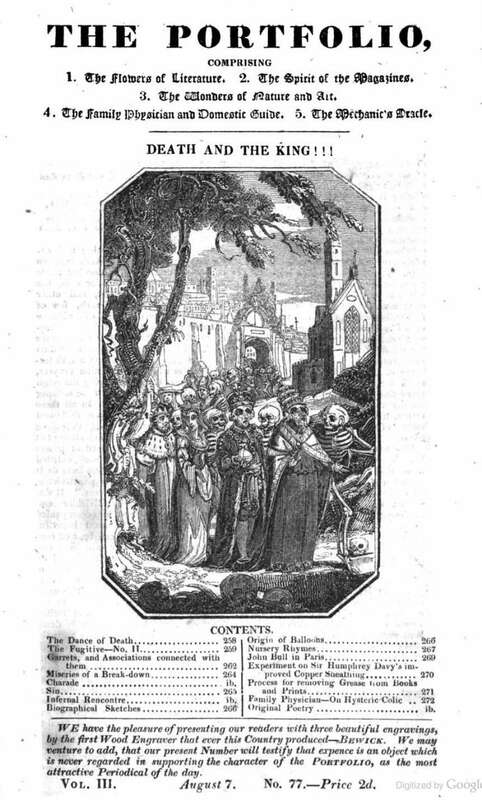 Charlton Wright Has just Published […] The celebrated Holbein's Dance of Death, with 52 spirited Engravings by the celebrated Bewick, beautifully printed« — and verily, in 1825 William Charlton Wright published »The Dance of Death of the celebrated Hans Holbein, in a Series of Fifty-two Engravings on Wood by Mr. Bewick« (pictures left and right). The octagonal woodcuts are those from The Portfolio with the same mixture of borrowed texts and borrowed verses. The book started with seven pages about the life of Holbein, which was copied verbatim from the 1814-edition of The General biographical dictionary, vol. 18, pp. 57-61. 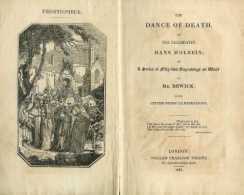 Then followed Douce's introduction about dances of death, which was taken from the 1816-edition of Hollar. 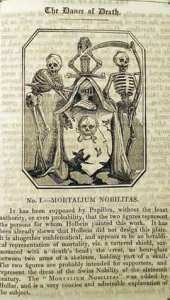 In this book Death's Escutcheon had been added and was adorned by a description from the 1816-edition of Hollar. This one description was written by Douce, and the result was rather bizarre (see picture to the right). Equally strange is a footnote in the preface that says: »In the present edition, however, it was found requisite that the plates should be retouched, and it has been done with the utmost attention to the preservation of their original spirit and character«. This footnote was borrowed along with the rest of Douce's preface, and it referred to Hollar's old copper plates, which had been "refreshed" for the 1816-edition of Hollar. The remark makes no sense in connection with neither the real nor the fake Bewick.
" 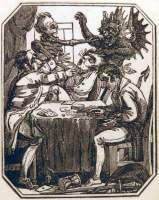 for purposes of caricature"
In England, Douce(2) doubted that the cuts were made by Bewick, »… the cuts, if Bewick's, [are] very inferior to those in his other works« and he called them »ridiculously modernised«; in Germany, Massmann(3) wrote »arg modernisirt«; and in France, Brunet(4) characterized them as »Copie médiocre et infidèle« and Langlois(5) added: »ridiculement modernisées et d'une exécution médiocre«. The American Warthin(6) summed it up: »The cuts with several exceptions are imitations of the original Holbein, but are absurdly modernized; both the costumes and the properties are represented in the contemporary style … [they] have somewhat the quality of caricature in them […] If these cuts are Bewick's, which Douce seems to doubt, they are far inferior to his other work, and executed in a different style. 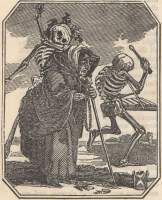 They represent a far departure from the old medieval conceptions and treatment, and betray the tendency of the early nineteenth century to use the Dance of Death motive for purposes of caricature«. The woodcuts were also printed on broadsheets with the title »Printed from Original Woodcuts, Engraved by Thomas and John Bewick«. Curiously enough, a former owner has struck out the words "Thomas and" — as if it was more probable that the woodcuts were made by John, who had been dead for 30 years. 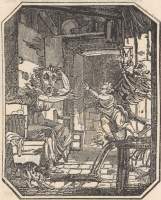 One must agree with the critics: The woodcuts are "for purposes of caricature" and "ridiculously modernised", and there's no way they were made by the brothers Bewick. But they are rather amusing, and a nice change of pace compared to John Bewick's more indifferent copies and the stilted text. These woodcuts are one more example of works wrongly attributed to John Bewick. 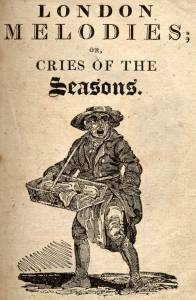 In 2015 historian Dr. Ruth Richardson observed that the same artist had illustrated two books named »Cries of London« and »London Melodies«; books about the street vendors of London. Dr. Richardson identified the artist as Luke Clennell, an apprentice of Thomas Bewick (see the external links). 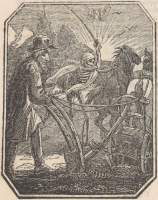 Luke Clennell (1781 - 1840) as a young man had worked for Thomas Bewick, until he discovered that the woodcuts, which he sold to Bewick for 2£, were re-sold by Bewick under his own name for 5£. Since Clennell had in his youth produced woodcuts in Bewick's name there is a certain logic in Clennell later calling himself "Mr. Bewick". Nevertheless there are some problems. First of all, "Cries" and "Melodies" are different in style. Secondly both "Cries" and "Melodies" are as anonymous as the dance of death is. And thirdly, Clennell spent many of his late years in an asylum unable to work. The story is told differently by the various sources, but Wikipedia writes: »Clennell resumed work on the picture of the Allied Sovereigns in 1817, but suffered another bout of depressive mental illness, and his family found him throwing his palette and brushes at the canvas, "to get the proper expression. 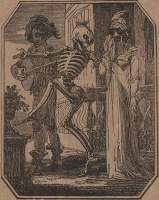 From then until his death in a Newcastle asylum in 1840 he was never well enough to work as an artist«. 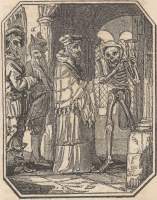 The line in the Dance of Death is by someone who has consummate skill, extremely experienced, but at the same time, it has a brittle edge to it quite unlike any easily identifiable engraver of that time apart from Clennell. When they say that he didn't work as an artist, they do NOT say that he did not work as an engraver. The scumbled foregrounding and elongated hands/feet feel Clennellish to me, possibly after Thurston/with Nesbit? It's the combination of superb skill, boldness and brittleness of the line/expressions that feel as if they could be by someone suffering a fragile/sardonic take on the world. I am quite prepared to be wrong!! So that is as close as we can get to an answer. 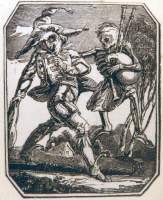 The dance was probably executed by Luke Clennell, but in cooperation with other of Bewick's old pupils, which might include John Thurston and Charlton Nesbit. 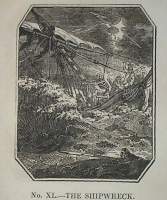 Most of the broadsheet can be found on this page about Bewick. The letter from Thomas Bewick is quoted from the book Bewick to Dovaston: Letters 1824-1828, page 47. Douce doesn't seem to have noticed that the letter-press for the Escutcheon of Death (see picture on this page) was borrowed from him. 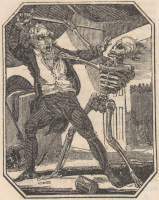 Eustache-Hyacinthe Langlois, »Essai historique, philosophique et pittoresque sur les danses des morts«, page 124. Aldred Scott Warthin »The Doctor of the Dance of Death«, 1931, page 82-83.